Turkish President Recep Tayyip Erdoğan said on Saturday the U.S. could not be called a civilized country after arrest warrants were issued for his security guards following incidents in Washington D.C.
"If America issues arrest warrants for my 13 bodyguards in a country where I went upon invitation, I'm sorry, but I will not say that country is civilized," Erdoğan said at the Civilizations Forum at Ibn Haldun University in Istanbul. "What do they call America? The cradle of democracy. Such a thing cannot be a democracy and its name cannot be democracy," he said. On June 15, the U.S. issued arrest warrants for 16 people including Erdoğan's bodyguards allegedly linked with a brawl outside the Turkish embassy in Washington during the Turkish president's visit in May. The president said he and his security team faced threats during his visit. "They [security guards] took measures for us. And even two of them [guards] were not even there. Can there be such justice?" Erdoğan said. 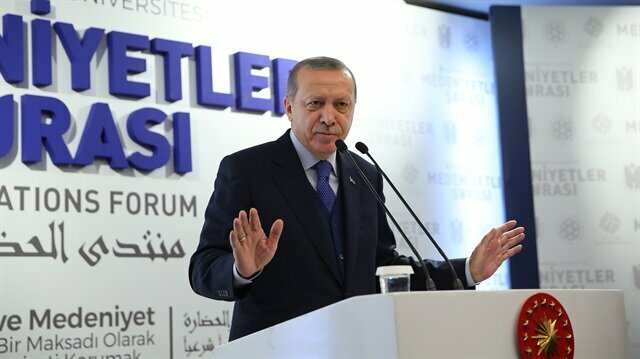 Erdoğan also criticized U.S. President Donald Trump's policy regarding Muslims saying Turkey never closed its doors to people who thought differently. "Muslims in America are facing expulsion so it means there is a problem in the country," he said. The Trump administration laid out late last month new restrictions to replace Trump's previous travel ban, which was set to expire, adding two non-Muslim-majority countries to the list of designated nations while dropping Sudan. “We have not closed the doors to people of different thoughts. We believe human beings are worthy of respect and honor. It appears that this is not the case in America, and the current situation is troubling," Erdoğan said. The countries that face travel restrictions under Trump's new order are Chad, Iran, Libya, North Korea, Somalia, Venezuela and Yemen. They were designated because they have either not met higher screening and information sharing requirements or present what officials call sufficient risk factors. This latest attempt to curtail immigration to the U.S. was dealt a legal setback after a Hawaii judge ruled Tuesday that it suffers from the same legal deficiencies as his previous directives. The ban was set to go into effect within hours when U.S. District Judge Derrick Watson said in his ruling that Trump's latest executive order "suffers from precisely the same maladies as its predecessor". The conflict in Myanmar’s restive Rakhine State is more about Rohingya-phobia than Islamophobia, said a leading French academic and historian.Since Aug. 25, around 589,000 Rohingya have crossed into Bangladesh, according to the UN.The refugees are still fleeing a military operation in which security forces and Buddhist mobs have killed men, women and children, looted homes and torched Rohingya villages.“It’s more about Rohingya-phobia than Islamophobia. Despite the violence of the last weeks, there were no riots throughout the province and no revenge attacks anywhere in the country,” Jacques Leider of French Institute of Asian Studies told Anadolu Agency in an interview via email.He said the current events underscored more than ever the need for communal peace, noting that polarized perceptions seem more effective and “firmly entrenched”.“Internationally, Myanmar is seen as trying to defend something that cannot be argued about because it concerns human rights violations; internally, the Buddhist community feels threatened by a global alliance of Muslim states and organizations,” he added.He highlighted the colonial background of the conflict, which he said, was entirely forgotten. “The demographic gap between the rapidly growing Muslim community and the Buddhist Rakhine community is ignored as a driver of tensions throughout the last decades.”- Loss of citizenship right“Obviously there has been, and it has been largely emphasized, a systematic marginalization of the Rohingya Muslims that goes back to the 1970s. The loss of citizenship rights is but one aspect,” he added.He also blamed international media for one-sided coverage.“Most of the international media [Western and Middle East] have not been interested in the historical complexity of the issue, but only in the humanitarian situation and human rights’ violations of the Muslim community claiming the Rohingya identity. So, the key word in the media narrative on this particular conflict has not been communal peace, but justice for the Rohingya Muslims. "Since independence in 1948, there has been a communal strive that has kept Buddhist-Muslim relations at a constant low, he noted.“International media reflect this conflict only as a simplified binary issue: racist Buddhist state with local support against helpless Muslims. However, this is only one aspect of a complex political reality,” he added.He said, as the details and the complexity of the conflict remains poorly known and as the international media have generally sided with the moral cause of the Muslim victims, the dominant narrative of the conflict has barely changed over the last five years.“The result is that Myanmar feels misunderstood and the Rohingya still lack any support within the country,” he stated.- Turkey's aid campaignDrawing on the army’s fears about the situation, he pointed out: “The army sees national security as its main task and the driver is geopolitical rather than religious.”On Turkey’s aid campaign to Myanmar, he stressed: “Turkey’s competence to act in such a field need not be questioned. Turkey and Myanmar look back on centuries of historical experience of tolerant coexistence of religious groups. But both countries had also experiences that disprove this noble heritage.“So, Turkey should be able to empathize with Myanmar at a time when things have turned bad,” he concluded.Rohingya, described by the UN as the world's most persecuted people, have faced heightened fears of attack since dozens were killed in communal violence in 2012.Last October, following attacks on border posts in Maungdaw, security forces launched a five-month crackdown in which, according to Rohingya groups, around 400 people were killed.The UN documented mass gang rapes, killings -- including of infants and young children -- brutal beatings, and disappearances committed by security personnel. In a report, UN investigators said such violations may have constituted crimes against humanity. Erdoğan also said the U.S. president used the term "terrorist" solely for Muslims. "In America, Mr. Trump labels Muslims as terrorists. Here you are, the Buddhists in Myanmar killed Muslims of Rohingya. Can they call the Buddhists in the same way? No. Why? Because they do yoga. Could it be such a nonsense? Do they say the same thing for Christians or Jewish terrorists? No," he said. Since Aug. 25, around 589,000 Rohingya have crossed into Bangladesh, according to the UN. The refugees are still fleeing a military operation in which security forces and Buddhist mobs have killed men, women and children, looted homes and torched Rohingya villages. "And while we fight, we say that Daesh has nothing to do with Islam. We are saying that Daesh is not related to Islam in interviews and at every international meeting," Erdoğan said. "But you cannot make them understand and unfortunately they make Muslims kill Muslims," he added. "They also supply free weapons. We want weapons with our money to defend [ourselves], they do not give us weapons. We are in such a strange world." The ninth summit of the Developing-8 Organization for Economic Cooperation (D-8) ended on Friday with a joint declaration reaffirming the group's commitments to establish peace, democracy, and solidarity among the member states.Istanbul was hosting the ninth summit of the D-8, of which the theme was "Expanding Opportunities through Cooperation". Alongside Turkey, Indonesia, Bangladesh, Egypt, Iran, Malaysia, Nigeria and Pakistan created the organization based in Istanbul.In the declaration, the member states also celebrated the 20th anniversary of the creation of the D-8, adding that the organization had “entered a new phase of economic cooperation and development”. The organization stressed the importance of “deepening the sectorial cooperation for deeper private sector involvement in all activities in order to attain 20 percent of total intra-D-8 trade”. Member states also agreed to establish a “D-8 Project Support Fund” in order to sustain various projects. The declaration underlined the progress in civil aviation, and in the development of all modes of transportation in order to connect all member states.It also welcomed Iran’s initiative to establish a D-8 university.D-8 member states should pen visa and the customs agreements as soon as possible, added the declaration.Turkey can make D-8 more effective, says PakistanCombined GDP of $3.7 trillionThe Istanbul declaration also urged “the establishment of D-8 Technology Transfer and Exchange Network (TTEN) and D-8 Petrochemical Association for the facilitation of transfer of technology and enhanced cooperation in the petrochemical sector”.The D-8 members condemned extra-territorial jurisdiction and unilateral economic sanctions as tools of political or economic pressure against D-8 member states.It also applauded Turkish President Recep Tayyip Erdogan, the Turkish government and the people of Turkey "for their warm and generous hospitality and further express full solidarity with them against the coup attempt that took place in 2016". The defeated coup on July 15, 2016 that martyred 250 peope in Turkey was orchestrated by U.S. based Fetullah Gülen and his Fetullah Terrorist Organization (FETÖ). The D-8 was launched on June 15, 1997, after Turkey's then-prime minister, Necmettin Erbakan proposed the creation of an economic group consisting of eight emerging economies from the Muslim world.Today, it has a combined GDP of $3.7 trillion and includes more than 1 billion people -- around 15 percent of the world’s population.Azerbaijan and Guinea attended the summit as guest states.Bangladesh has offered to host the 10th D-8 summit in 2019. “The notion that the world is greater than five [powers] is a call to justice as well as an outcry of civilization. Five countries determine the fate of the world. This cannot be the case. As the world progresses, politics also needs to be updated,” Erdoğan said. The president has previously criticized the structure of the United Nations Security Council (UNSC) for its unequal system. “If the principles of Islam were prevalent across the world, the crises we are suffering would not be happening. I am still defending the alliance of civilizations. 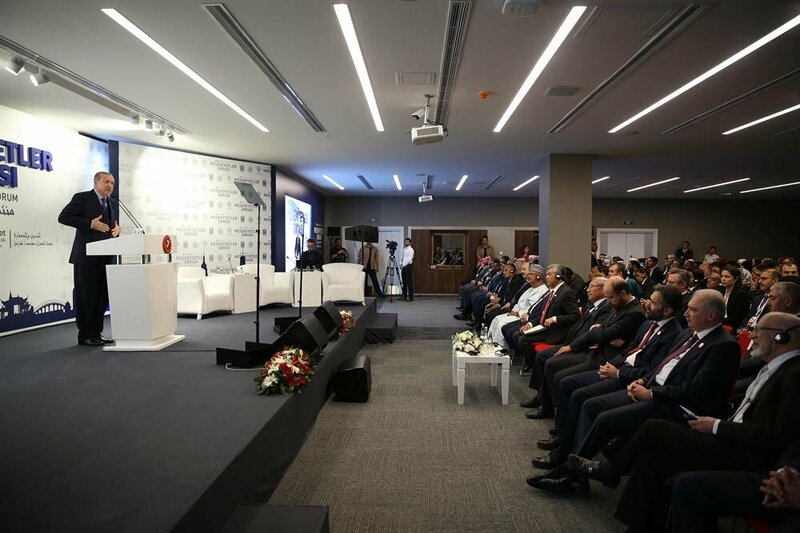 As Muslims, we should be aware of the depth of our own civilization,” Erdoğan said.